Helen is serving a life sentence at Sloatsburg women's prison for the murder of her children. Dr. Louise Forrest, a recently divorced mother of an eight-year-old boy, is the new chief of psychiatry there. Captain Ike Bradshaw is the corrections officer who wants her. And Angie, an ambitious Hollywood starlet contacted by Helen, is intent on nothing but fame. 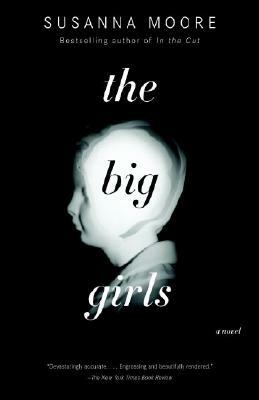 Drawing these four characters together in a story of shocking and disturbing revelations, The Big Girls is an electrifying novel about the anarchy of families, the sometimes destructive power of maternal instinct, and the cult of celebrity. The Big Girls has four alternating narrators—Louise Forrest, Helen, Captain Ike Bradshaw, and Angie Mills. Why would Susanna Moore choose to tell the story from four distinctive and subjective points of view? How does this multi-vocal narration affect the reader's relationship to the novel? What is the advantage of letting the characters speak for themselves? How does Moore manage to make Helen, a woman who has murdered her two young children, such a sympathetic character? What is it about Helen that elicits such care and compassion from Louise? Is she a tragic figure? Louise says of her training "I'd been trained to believe in pathological models: bad parents make bad people who can be treated with lots of drugs. I saw symptoms and behavior in an a-contextual model. I was not particularly tolerant. I'd like to say that my breakdown was the beginning of my training in compassion, but that would not be the truth. That training has begun only recently" [p. 43]. In what ways does Louise's understanding of and compassion for her patients deepen over the course of the novel? In what ways is the a-contextual "pathological model" an inadequate response to the real lives of the women at Sloatsburg? Near the end of the novel, Louise admits that she believes in the existence of evil. "Satan does not roam happily along Park Avenue in a form that is physically threatening, or even visible, but since coming to this place, I have seen evil. I don't think that it is a force in the world that is arbitrary and random, or that it is subjective or specific, or the consequence of sin, but it's here all the same" [p. 204]. Why does Louise come to believe in evil? Does the existence of evil help explain the crimes that are both inflicted on and committed by the women at Sloatsburg? To what extent does Helen's mental state—the violent demands of the "Messengers"—and her history of abuse mitigate her responsibility for her crimes? To what extent does she hold herself responsible? Louise says, "No matter how much I learn, no matter how instinctively sympathetic I am toward the women, and how deeply I still yearn to understand, I know less and less. I'm gullible. I'm condescending. Impatient. The encouragement of alternatives exhausts me. I've failed with Helen. I've failed with my son" [p. 194]. Is this an accurate or an unduly harsh self-assessment? Has Louise failed with Helen and with her son? Has she unwittingly contributed to Helen's suicide? In what ways does the boundary between Louise's personal and professional life begin to blur over the course of the novel? What is the irony in her own son's accusation that Ike Bradshaw has abused him? What does The Big Girls suggest about family life in America today? Louise observes that the relationships between attacker and victim are often the most intimate. Why would this be? Does the novel help readers understand why women murder their children or their husbands? What causes does it suggest for these brutal crimes? Are these women driven to violence for different reasons than men are? What peculiar social rules and rituals govern the lives of women in Sloatsburg? What function do these rules serve? In what ways are they like and unlike the social rules and rituals that prevail outside the prison walls? In what ways are Angie, Ike Bradshaw, and Rafael important to the novel? How do they help clarify the novel's main concerns? When Louise sees a "grotesque symmetry" in the fact that Helen's imagined sister Angie, is her ex-husband's lover, she says she may have to "change [her] mind about coincidence" [p. 209]. What is the significance of these "coincidences"? Why is the symmetry "grotesque"? Louise says of Helen: "The tension between her conscious self and the self that she has so long kept hidden is so delicate that I am frightened for her. I always knew how dangerous knowledge would be to her, but must I still hold to the belief that her ignorance is equally dangerous?" [p. 133]. Does increasing Helen's consciousness of her own experience help or hurt her? Does she attain a measure of peace before her death?